Seattle Opera's new civic home, the Opera Center, kicks off with a Grand Opening on Dec. 15. 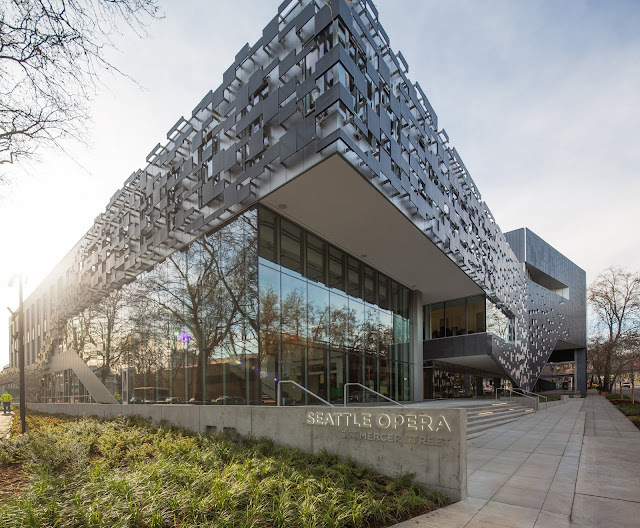 At long last, Seattle Opera's dream is being realized: the company will soon move into its new civic home on the Seattle Center campus. "Our new building is beautiful, magical, welcoming, larger-than-life, and world-class—just like what Seattle Opera aspires to be," said Dominica Myers, Associate Director of Administration. "Our new workplace will now reflect our company and art form." Dominica's words echo the feeling in our hearts at Seattle Opera. We, members of the staff, wanted to share why this building matters so much to us. We invite you to come explore it for yourself on Dec. 15 at our Grand Opening. 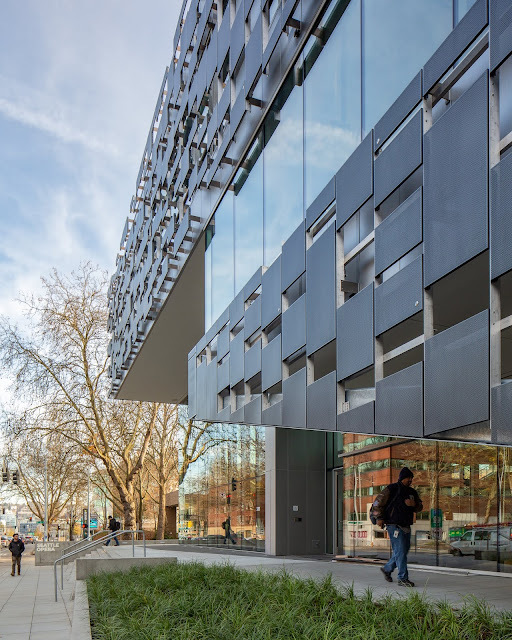 "This new building gives us a ‘physical’ presence. When our offices were located in South Lake Union, much of the public wasn't aware of where our day-to-day operations were happening. So I think this new space will bring stronger ties to the community and to our performance space. Also, I think the physical closeness of the building to McCaw Hall will impact the administrative staff; getting to witness the process of putting on a show will be more accessible and bring a stronger sense of purpose to our daily work, which at times feels removed from the art." "The transparency and inviting nature of our new home will bring the public closer to understanding opera more than ever before. The viewing garden and windows into the operations of our organization will allow the curtain to be lifted from the tremendous work that is done at every stage of our organization. We all have known what it takes to put on productions of this scale, and now everyone can get a glimpse into that daily life." "Long story short: My personal/special tie to the new building is my dad used to play hockey in the old Mercer Arena and was one of my biggest supporters as I studied opera. With his passing coming up on a year and half, it feels like he is passing the baton off to me as a force for good in the community. My dad sought to bring people together through team sports. 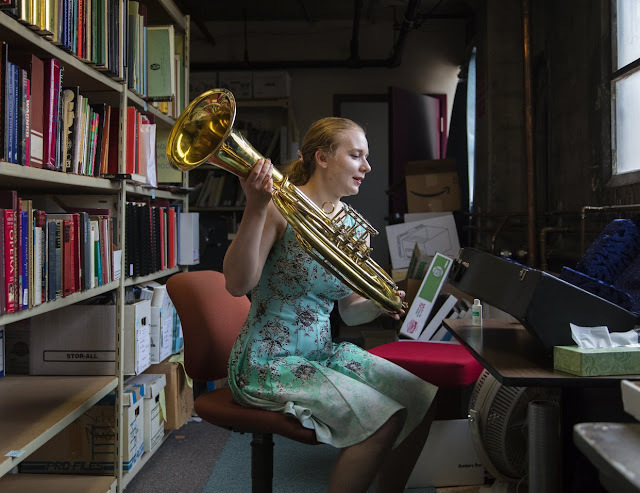 I hope to help bring people together through opera." "I am personally excited for better bike facilities, and more window light in the office spaces. Everything about the new space will do a better job of supporting the well-being of staff, which might reduce some stress ... Finally, I can’t wait for a welcoming, safe, accessible and well-equipped space to do more performances, in addition to the mainstage shows. That will contribute so much to what Lower Queen Anne has to offer, which is already a center of gravity for the arts in Seattle." 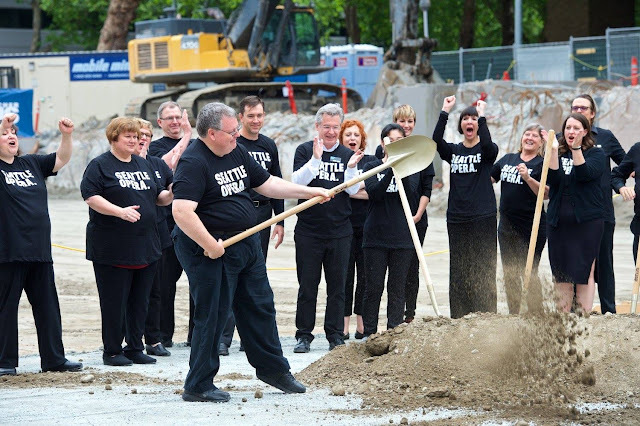 "I am excited about moving to the Seattle Center campus to have a location that showcases the operatic art form to the public every day, in every phase of an opera’s production, not just the practiced and polished parts seen at McCaw Hall ... Our potential audience members need more entry points, more inspiring and captivating engagement opportunities. In an era where it is ever-easier to access arts and entertainment via your living room, we must give people reasons to join the opera family." 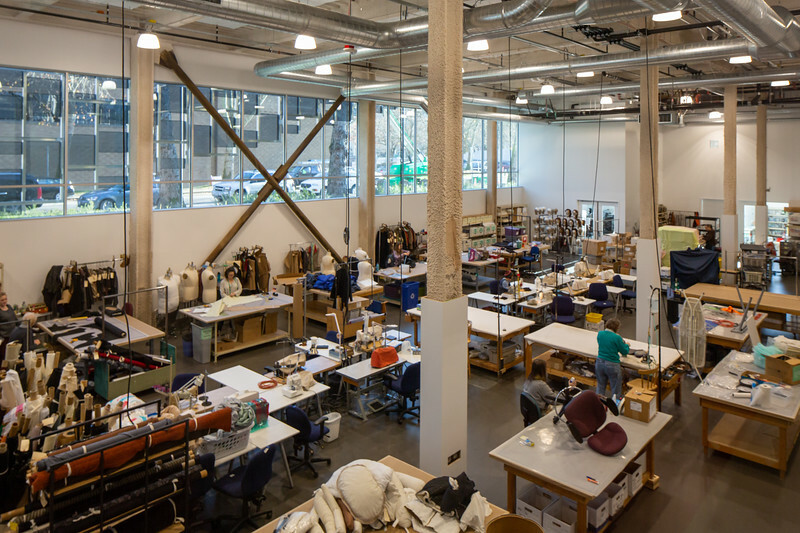 Both passersby and people walking around inside the first floor will have a birds-eye view of Seattle Opera's celebrated costume shop. Sean Airhart photo. ...In the beautiful new space, I hope to build a more equitable collection—to actively collect more books about race and gender in opera and theater. And by doing so, to make sure that when people come into my library no matter what they think about opera, they leave having read the voices of people who genuinely believe that this art form matters and can be a force for social justice as well as artistic. THIS HAS BEEN MY VERY SELFISH STORY OF WHY I AM EXCITED ABOUT THE NEW BUILDING." - Fully joining the Seattle Center Resident Organization Family—right now with our part-time tenancy at McCaw Hall, we feel more like extended family or first cousins. It will be nice to be a part of Seattle Center all the time. - Being in a neighborhood known for culture, vibrancy, communal gathering, and character. - Having more than one toilet. - Having an office floor plan more conducive to walking/activity/fitness. - Having an easier time telling vendors and customers how to find us. - Having an ADA box office and front entry. - An integrated operations center will bring together the entire company (i.e. employees from all departments). Working more closely together as a holistic group will allow everyone at every level to take more ownership/pride in everything we do." "In many ways, the Seattle we have today is not the weird, artistic, grungy Seattle where I grew up. Some changes have taken our community in completely new directions. But I believe this particular new construction will preserve and enrich the city's culture. Here on the Seattle Center campus, where I spent summers as a rebellious teenager at Bumbershoot, winters being filled with wonder at PNB's Nutcracker and where, as a young kid, my creativity was sparked by Seattle Children's Theater and Seattle Children's Museum, (special places I now take my toddler), I can still feel the heart and soul of the same Seattle that made me. For this reason, and reasons my colleagues have eloquently expressed, I am going to enjoy working here so much. 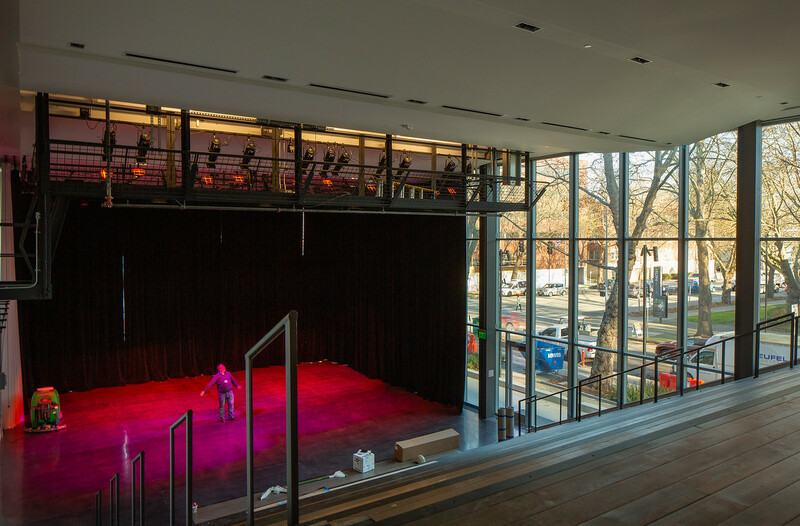 But the bottom line is, opera, like these different treasures on the Seattle Center campus, exists for all of us. The new building embodies that spirit of love and welcome." "Our new building symbolizes who we are NOW. 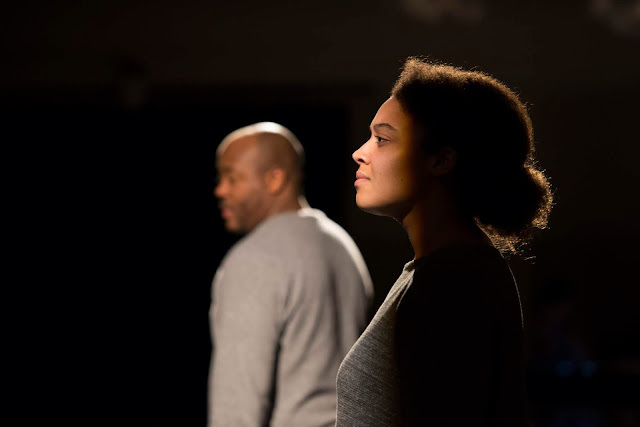 Much has changed since an ambitious but tight-fisted 'scrappy underdog' arts organization rented an old warehouse in a less-than-glamorous neighborhood. The role opera plays in our community has evolved. Seattle Opera used to be a status symbol for a municipality that had aspirations to be a major world city, but wasn’t quite there yet; the idea was, if people associated Seattle with ‘world-class opera’ (whatever that may be), movers and shakers from other cities would start to take Seattle seriously. Today, Seattle is one of the world’s most important cities, and we certainly don’t need a fancy opera company to prove that point. 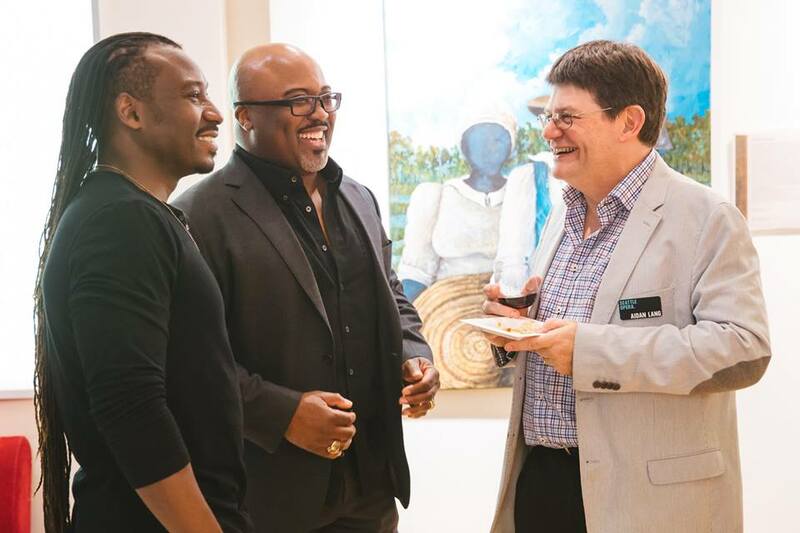 What we need is an arts sector dedicated to bringing together people who might otherwise never meet, giving us all opportunities to LISTEN, and to celebrate our shared humanity. The new building will make that a palpable reality." 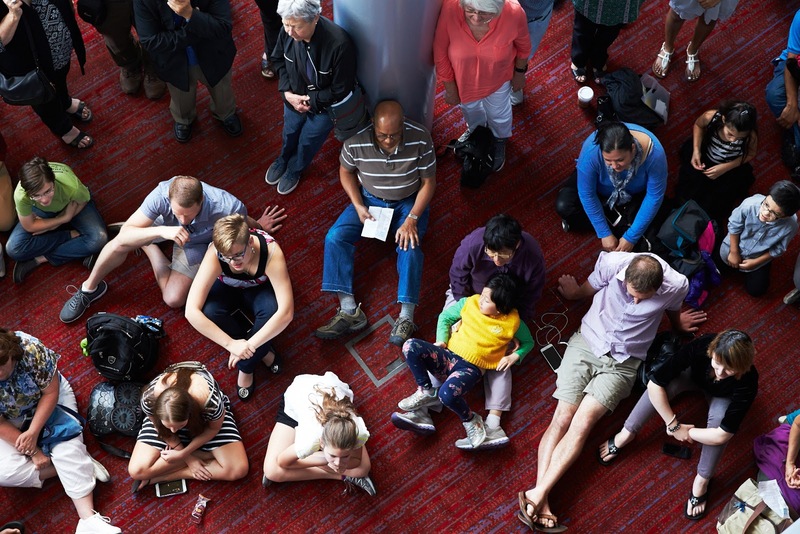 Photo of a Seattle Opera SummerFest event by Philip Newton.